AEC was awarded this project by American Construction Company (ACC) to perform the transload and disposal activities for the US Army Corps of Engineers Seattle District. 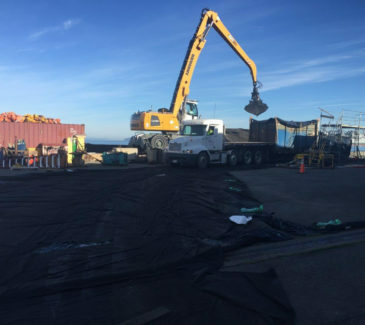 The work took place at Grays Harbor Inner Harbor, with ACC performing the dredging and deepening activities, and transporting the dredge material via barge to the transload area located at the Terminal 3 dock. Our team was responsible for the preparation and installation of the rehandling and treatment facility on the dock, including the creation of a spill apron and berm in order to prevent dredge spoils from reentering the waterway untreated or spilling along the transload area. The spill apron was constructed out of 15-20’ wooden beams, ecology blocks, plywood, and an impermeable liner. Using a Liebherr LH50 long-reach excavator with clamshell bucket attachment, AEC removed approximately 10,000 CY of dredged material from the two (2) barges each day, and direct loaded it into watertight dump trucks. 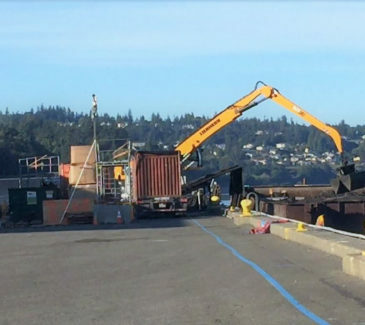 From the transload area, crews transported the dredge spoils off the dock and to the northwest end of the property to the delineated disposal site. 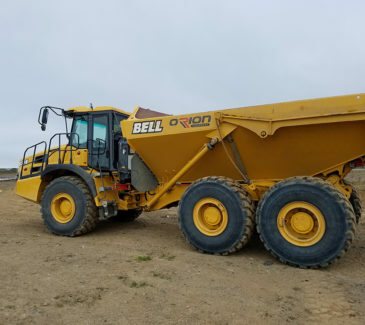 At the fill/disposal area, AEC operators deposited and graded the material using a loader and bulldozer. AEC also installed a temporary site drainage and collection system separate from the existing storm drainage system on the dock. 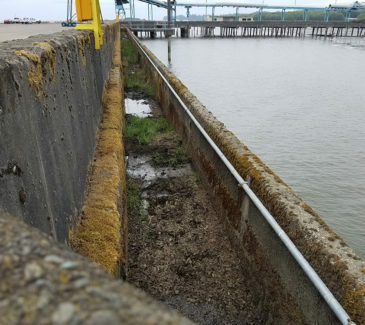 All water materials including both dredge runoff and exclusion zone wash runoff, was secured and treated in AEC-provided Baker Tanks with weir additions for filtration and subsequent reintroduction into the harbor. Crews were commended by our client for maintaining and even exceeding the stringent schedule for this project, and performing all work safely and according to project requirements.